Charles Darwin knew that there was a significant event in the history of life that his theory did not explain. In what is known today as the "Cambrian explosion," 530 million years ago many animals suddenly appeared in the fossil record without apparent ancestors in earlier layers of rock. In Darwin's Doubt Stephen C. Meyer tells the story of the mystery surrounding this explosion of animal life--a mystery that has intensified, not only because the expected ancestors of these animals have not been found, but also because scientists have learned more about what it takes to construct an animal.Expanding on the compelling case he presented in his last book, Signature in the Cell, Meyer argues that the theory of intelligent design--which holds that certain features of the universe and of living things are best explained by an intelligent cause, not an undirected process such as natural selection--is ultimately the best explanation for the origin of the Cambrian animals. 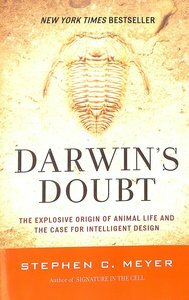 About "Darwin's Doubt: The Explosive Origin of Animal Life and the Case For Intelligent Design (2014 Edition)"
Dr. Stephen C. Meyer (Ph.D., University of Cambridge) is the director and Senior Fellow of the Center for Science and Culture at the Discovery Institute in Seattle which has considerable reach into the religious market. Meyer set off a firstorm of media and political attention when the Smithsonian Institution published his pro-Intellegent Design paper in its scientific journal in 2005. Meyer earned his Ph.D. in the History and Philosophy of Science from Cambridge University for a dissertation on the history of origin of life biology and the methodology of the historical sciences. Previously he worked as a geophysicist with the Atlantic Richfield Company after earning his undergraduate degrees in Physics and Geology. Meyer has been featured on national television and radio programs such as The Jim Lehrer News Hour, CBS Sunday Morning, NBC Nightly News, ABC Nightly News, Good Morning America, Nightline, Paula Zahn Now (CNN), Topic A with Tina Brown (CNN), Weekend Live with Tony Snow (FOX), The Big Story with John Gibson (FOX), Fox TV News with David Asman, The Tavis Smiley Show (PBS) and others. He has also been the subject of two front pages stories in the New York Times and has garnered attention in other top national print.